The history of afternoon tea complete with scones, jam, clotted cream, finger sandwiches and other tasty confections was born in the 1840s when the Duchess of Bedford, Anna Maria Stanhope, requested some nibbles to quell the "sinking feeling" she had in the late afternoons. In other words, the long gap between breakfast and dinner left her feeling quite hungry around 5 in the afternoon. Taking afternoon tea was an established custom at that time, but having a "meal" to go along with it was not. Hence, the Duchess ushered in the tradition of afternoon "low tea" where tea and snacks were partaken of on a low tea table (as opposed to the tradition that developed of "high tea" where supper was partaken of at a formal dining table high enough in which chairs could be placed underneath it). Were scones part of the Duchess's first foray into this tasty tradition? Probably not. 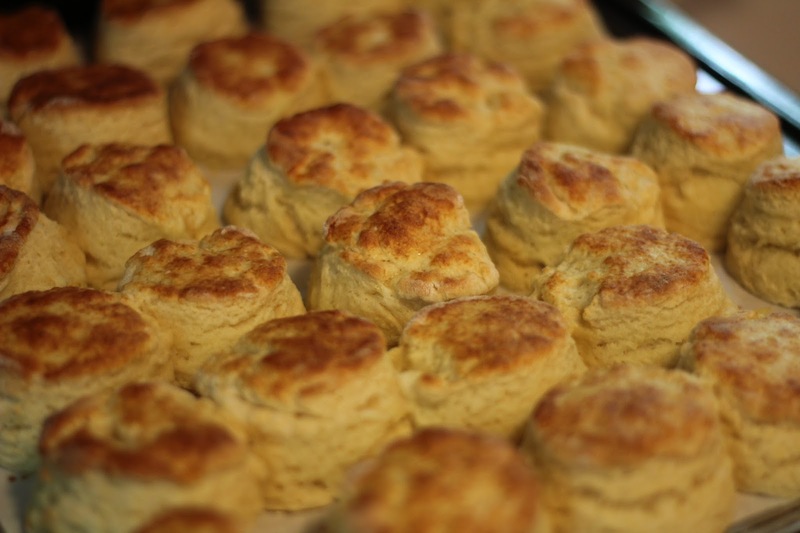 The earliest scones hail from Scotland and were essentially griddle cakes made with barley and/or oats. These were made in circles and then cut into pie-shaped wedges. What we know of as proper British scones are slightly sweet cakes baked in circle cut-outs and made with wheat flour and lots of baking powder, an innovation of the later part of the 19th century. So, the Duchess had to make do with dainty bread and butter sandwiches instead! 1. Heat the oven to 425º F. and make sure that a rack is placed in the center of the oven. Then, line a cookie sheet with parchment paper. 2. In a food processor, pulse the flour, sugar, baking powder, and salt, just until well-blended (about 5 pulses). 3. Add the butter to the food processor and pulse about 20 times to create a mixture that has pea-sized bits of butter evenly distributed throughout. 4. Using a 2-cup capacity measuring cup, measure the milk and then add the eggs. Whisk the eggs until the milk/egg mixture is frothy. Then remove about 3 tablespoons of this mixture to use later as a glaze. 5. Add the milk/egg mixture to the flour/butter mixture in the food processor by gently pulsing as you pour in the liquid. Pulse until the mixture comes together. It will be a little bit sticky. 6. 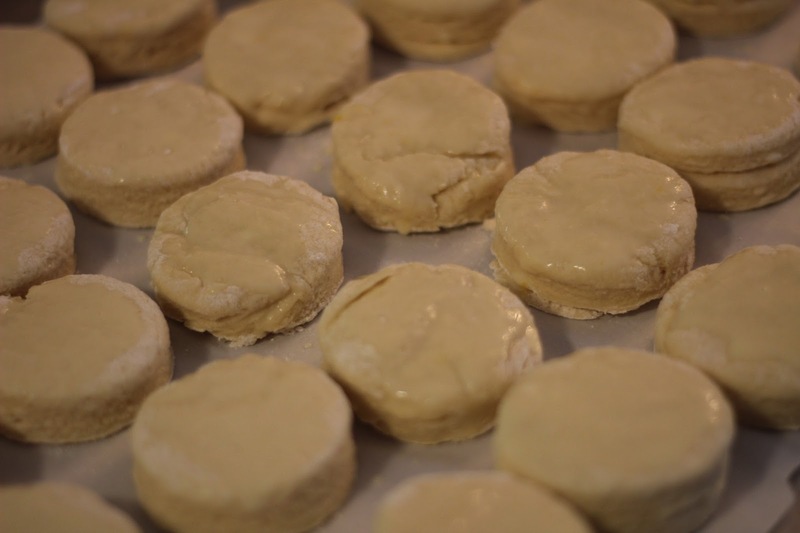 Place flour on a board and then place the scone dough on top. Add more flour on top of the dough and gently knead until the dough is no longer sticky. Roll the dough out until it is about one-inch thick. 7. Use a 2.5" round cutter to cut out 20 circles. You will need to re-gather and re-roll the dough out to get 20. Glaze the tops of the scones with the reserved milk/egg mixture. 9. Bake for about 8 minutes and then reduce the temperature to 350º F and bake about 2-3 more minutes until the biscuits are golden and have puffed up nicely. Amusingly, the scone recipe in my family is always baked in the round and sliced into pie shapes. I was confused when I first encountered scones that weren't like that!